What does it mean to be an Apple Distinguished School? Since 2012, New Hampton School has been recognized by Apple for meeting criteria for innovation, leadership, and educational excellence, and demonstrating Apple's vision of exemplary learning environments. 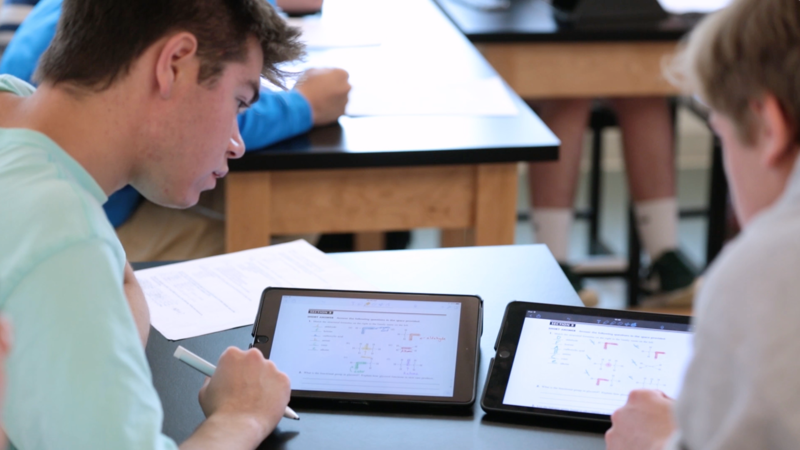 In 2010, New Hampton stood out as an innovative boarding school willing to pilot a comprehensive 1:1 iPad program with comprehensive technology integration for teachers. 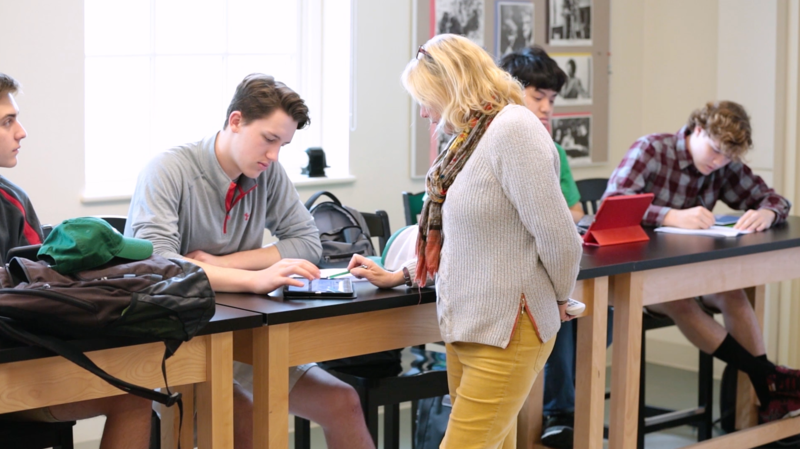 The ongoing selection of New Hampton School as an Apple Distinguished School highlights its successes in enhancing and extending teaching and learning with thoughtful and innovative implementations of technology. Today, New Hampton School believes that learning is a personal experience for every student, which is a challenge when trying to make teaching more individualized. However, the iPad Program gives students the freedom and ability to explore how they learn best through the use of a many different apps. For example, teachers can help students be more active in their learning by choosing to read and highlight an iBook or use Notability for writing, recording, and interacting with others. With the entire school using iPads, online learning and flipped classroom techniques are more accessible. These are just a few examples of the 1:1 iPad program at work in our classrooms. When New Hampton School developed a Strategic Plan in 2006, Head of School, the Administration, and Board of Trustees set out to improve everything the school does with intention. A critical aspect of this plan was to look at the necessary resources and philosophies that inspire faculty and staff to deliver the most relevant education possible. In addition to a mission that strives “to cultivate lifelong learners who serve as active global citizens,” we made it our vision to “innovatively prepare students for 21st-century leadership.” As a school that was an early adopter of campus-wide wireless, provided access to iMacs in state-of-the-art computer labs, and brought interactive white boards into classrooms, we believed strongly that technology could improve and enhance learning in and outside New Hampton School classrooms. So the introduction of iPads at New Hampton School was an incredibly deliberate and highly detailed process, borne out of conversations with the Board of Trustees and supported by a gift from the Class of 1960. The Pilot Program that ensued in 2010-2011 was the product of a strategic vision, support from the Board of Trustees, and the creative thinking of administrators and faculty. Learning is a personal experience for every student, which is a challenge when we try to make our teaching more individualized. However, our iPad Program has given students the freedom and ability to explore how they learn best through the use of a multitude of different apps. Teachers can help students be more active in their learning by choosing to read and highlight an iBook or use Notability for writing, recording, and interacting with others. The iPad Program has brought about an improvement in how students and teachers communicate with each other, and has led to our push to eliminate the necessity of using paper at our school. Students can respond to an assignment through the use of an app, submit a document electronically to their teacher, and then have it returned with comments. Students can access an assignment through a class web page and then download it to the iPad. As well, teachers have worked to transfer their textbooks to electronic copies that provide for either e-texts or online access that then enhances students’ abilities to use the Internet to broaden their learning experience. New Hampton School is focused on enhancing the culture of teaching and learning through professional development investment. Professional development programs, coordinated by the Dean of Faculty, engender an atmosphere of innovation, intellectual stimulation, and collegiality. We believe an inspired teacher leads to inspired students. Through professional development, New Hampton School is able to fund thoughtful and engaging opportunities that promote reflection, experimentation, and sharing. These funds are used in a strategic way, informed by individual interest, our teacher evaluation process, and leadership recommendations in order to help our faculty grow in all areas of their professional lives to best serve our student population. NHS encourages faculty to continue their education, professional development, and training. Faculty who wish to enroll in courses, conferences, seminars, or trainings discuss opportunities with their department head. We embarked on our iPad program in the fall of 2010, acutely aware of the newness of this technology. Would the iPad enhance teaching and learning? Would students become distracted by social media rather than pay attention to the teacher? We set out to answer these questions by framing how we expected the iPad to be used in the classroom, training teachers and students on these tasks, and then measuring outcomes. To establish a baseline, we surveyed every student in the program on the first day of school about their use of technology and level of mastery across core academic skills. After four months we surveyed the students again to track progress. The data was very encouraging. Students reported they used technology more often to complete their homework, communicate with their teachers, and stay organized. Not only were students using technology more often, but they were also improving their level of skill. Students reported increased mastery in important 21st-century skills like internet safety, source credibility, and electronic honesty. Our teachers create flexible learning environments to meet the students’ wide range of learning styles. Because technology is a significant factor in creating these learning environments, our facilities and schedules are intentionally designed to maximize learning opportunities that technology provides. Our class schedule consists of 70-minute blocks. Students typically take six courses that meet 3-4 times per week. These longer blocks maximize the face time our teachers have with students and minimize transitions. We also provide time in the schedule for students to seek extra help, complete coursework, collaborate with their peers, or to just relax through scheduled open blocks and office hours. The highlight of our current capital campaign was the opening of the Pilalas Math and Science Center in 2008. This state of the art building houses math and science classrooms and laboratories, all of which are outfitted with built-in speaker systems, ceiling mounted projectors, and interactive white boards. Our Meservey building, which houses the history department, will be similarly renovated next year. Technology is not only a important tool for students, but for faculty as well. Using tools like the iPad and Apple TV, instructors can utilize various apps to increase the quality of the learning experience. Teachers are able to utilize technology to teach in ways that allow instant feedback and calculation, so they can stay informed as to where their students are in the learning process.